Product #15702 | SKU PL3537T | 0.0 (no ratings yet) Thanks for your rating! 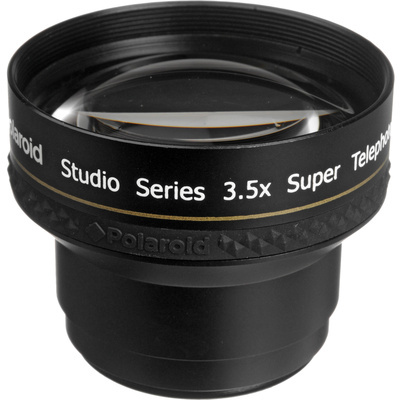 The Studio Series 37mm 3.5x HD Super Telephoto Lens makes a great cost-effective addition to any video or still camera kit. The precisely engineered, multi-coated glass magnifies the field of view of your base lens by an impressive 3.5x, turning a 50mm normal lens into a 175mm telephoto. Whether you're shooting with a camcorder's built-in zoom or a DSLR's interchangeable prime, this screw-on attachment lets you shoot from further away or more easily isolate your subject in the frame. As long as your lens' filter thread measures 37mm, this solid, lightweight performer will take you closer to the action.